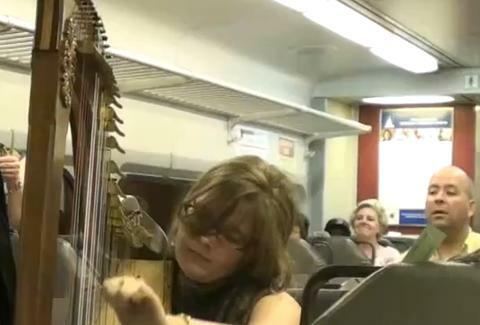 What's weirder than a girl hauling a gigantic harp onto a train? This video of her strumming tunes for her fellow former R-5 passengers. While the actual performance is impressive, be on the lookout for "lady in front vaguely aware that she's being filmed/suddenly concerned with her appearance", "shiny-headed fat dude continually popping up in the back", and the craziest/"this-thing-was-clearly-staged" part, the "helpful SEPTA conductor".